Thank you for your interest in spreading the word about October Unprocessed! Please find all the materials you’ll need right on this page. Contact Andrew with any questions or customizations. When October 2010 came along, Andrew decided to try the challenge again, in a bigger way. 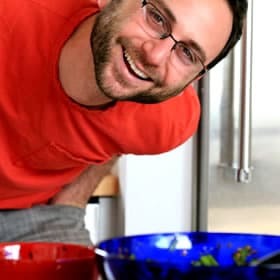 He reached out to fellow foodies, bloggers, and friends, and inspired 415 people to take the pledge. He shared over 40 guest posts to support the crew throughout the month. In its third year, October Unprocessed 2011 inspired over 3,000 people to take the pledge, increasing the movement by nearly ten-fold. Andrew’s blog, Eating Rules, hosted over 55 guest posts, on topics ranging from “healthy eating on a budget” to a Rabbi’s sharing about food & Judaism. In 2012, more than 6,000 people took the pledge, and in 2013, more than 15,600 people joined in! This year, our goal is to inspire 20,000 people to sign the pledge, committing to eating no processed foods whatsoever during the month of October. Andrew Wilder has been a “foodie” for as long as he can remember, but it wasn’t until his “a-ha!” moment in 2009 when he decided to make healthful living and eating a primary focus in his life. The turning point came after an experiment with a few friends, to try to eat zero processed foods for one entire month. “It was revelatory. Above all, I simply felt better.” From there, Andrew’s popular food blog, Eating Rules, and the October Unprocessed Challenge were born. Now in its fifth year, Andrew’s goal is to inspire 20,000 people to take the challenge. When he’s not blogging to help others find joy in healthful food, Andrew can be found working on related projects such as Blog Tutor, internet consulting and web design for food bloggers, and Healthy Ads, a boutique advertising network connecting ethical companies with health bloggers and their audiences. Andrew lives in Santa Monica, CA with his husband Matty, their rescue dog Molly, and a big green tray of “pet” composting worms. For interview requests & questions, contact Andrew.